I came across two U.S. Navy attack submarines in the waters off Maui. The ships are there apparently to conduct naval exercise. I hope the subs are not using their sonars since it may affect the whales' communication. They have excellent hearing hearing. Came across a few comp pods but there are no heated battles between the whales. Mostly bumping and racing each other. However, there are quite a few whales breaching. It is very difficult to take a good photo of breaching whales. The waters are vast and they can fly out anytime, anywhere. It is mostly luck and skill when one gets a good shot. 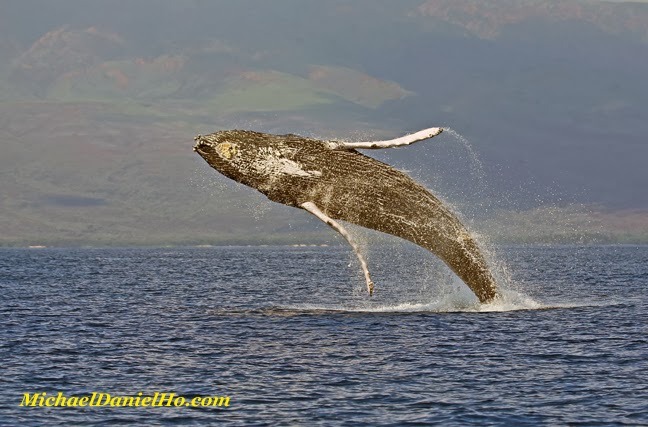 Visit my website MichaelDanielHo.com to see more photos of breaching whales from my previous trips. Your whale photography is simply amazing, especially the ones on your website. Great work.